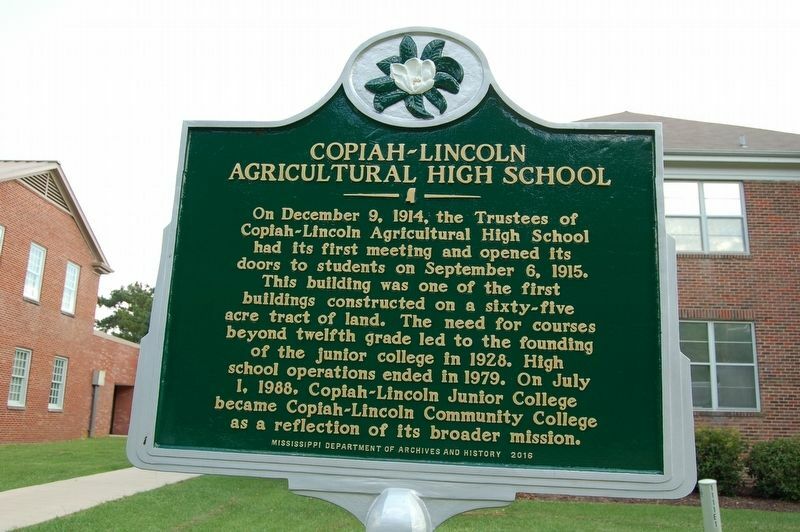 On December 9, 1914, the Trustees of Copiah-Lincoln Agricultural High School had its first meeting and opened its doors to students on September 6, 1915. 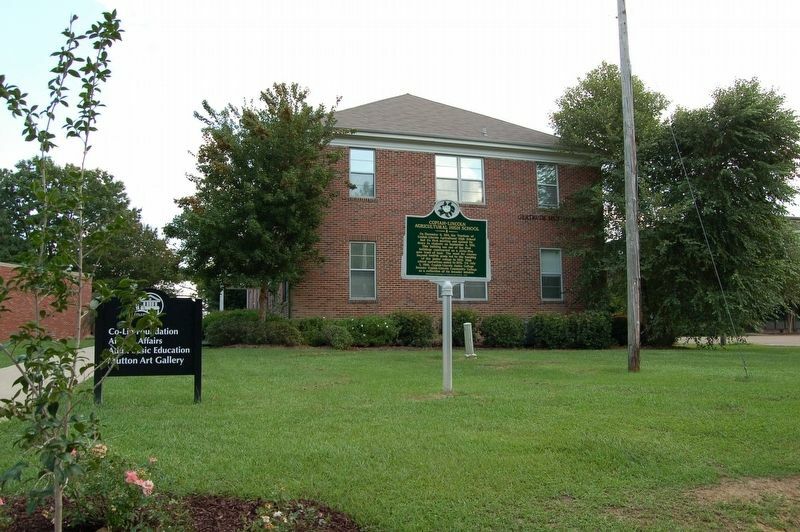 This building was one of the first buildings constructed on a sixty-five acre tract of land. The need for courses beyond twelfth grade led to the founding of the junior college in 1928. High school operations ended in 1979. On July 1, 1988. Copiah-Lincoln Junior College became Copiah-Lincoln Community College as a reflection of its broader mission. Location. 31° 41.501′ N, 90° 24.049′ W. Marker is in Wesson, Mississippi, in Copiah County. Marker is on Pine Street (Old U.S. 51) 0.2 miles north of Lester R. Furr Drive, on the right when traveling north. Touch for map. Marker is in this post office area: Wesson MS 39191, United States of America. Touch for directions. (approx. one mile away); Old Wesson Public School (approx. one mile away); New Sight School (approx. 3.7 miles away); Smith/Furr Pioneer Homesite (approx. 5.4 miles away); Heucks Retreat School (approx. 5.4 miles away); Pearlhaven (approx. 7½ miles away). Touch for a list and map of all markers in Wesson. More. Search the internet for Copiah-Lincoln Agricultural High School. Credits. This page was last revised on August 27, 2018. This page originally submitted on August 27, 2018, by Cajun Scrambler of Assumption, Louisiana. This page has been viewed 35 times since then and 7 times this year. Photos: 1, 2. submitted on August 27, 2018.